Design classes for students can be a great way to learn practical life skills. Design teacher, Taylor Schwartz, used these skills to create her own mini business while also teaching. Schwartz has had the hobby of sewing since seventh grade. “I just find it relaxing,” said Schwartz. For her mini business, Schwartz creates custom bomber jackets. Her business has been running for about a year. When she is not working on her business, Schwartz is working on new ideas for her classes. “My love for design started when I was in high school at Olathe East and I had really incredible teachers who helped me understand that these design classes were teaching me things I can use in all aspects of my life even if I never wanted to go into design,” Schwartz stated. A typical day for Schwartz starts pretty early. If she’s not running late, she attempts to make a pit stop at Scooters to get her favorite hazelnut ice latte. Then she has a normal teaching day. 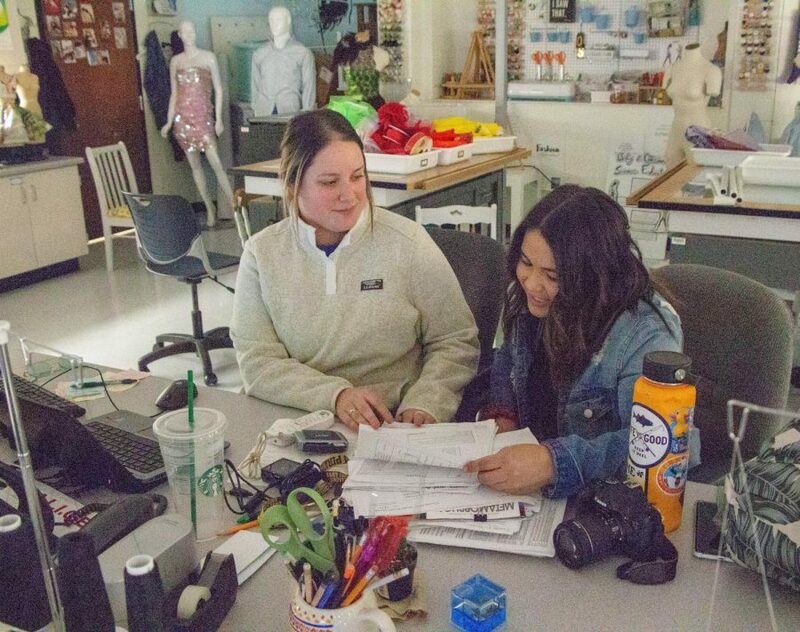 Schwartz teaches Interior Design 1 and 2, Apparel Production 1 and 2, and FAID Studio. Interior Design 1 focuses on the basis of interior design. For the final, students repurpose a piece of furniture and the design a room around the furniture item. Students also create a design board that show their personal aesthetic and style. Interior Design 2 uses everything learned in Interior Design 1 on a larger scale. Projects are either on your own or in small groups and are mostly residential interior design. Students also learn how to work with a client through projects. The final for this class is creating a dream home. Apparel Production 1 is a sewing class focused on making clothes. Students start with easier items like pajama pants, then more into more difficult clothing. If the class is taken second semester students gets to create an item for the fashion show and get to walk the runway. Apparel Production 2 is also a sewing class, but it is more independent and advanced. Students create a fashion line for the fashion show, are able to design their own fabric, and work more on group projects. They are also able to design costumes that aren’t necessarily worn every day. FAID Studio combines sewing, interior design, and fashion design students. This class is yearlong that focuses on four main projects. One project is retail design, where students design the items they will sell, the interior space, and create a business plan. 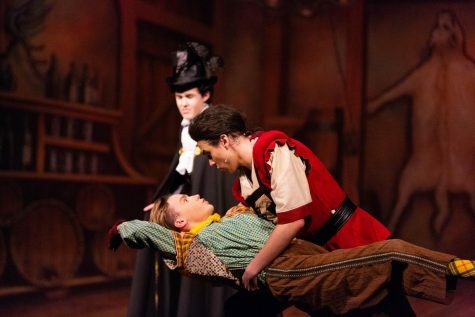 Other projects include magazine design where the students take their own photographs and create a magazine layout, costume and set design where students read a book that hasn’t been made into a movie and design sets and costumes for three scenes, and a commercial design project. With this project students showcase all they have learned by creating either a restaurant or a hotel, the uniforms employees would wear, draft the floor plans, and design interior spaces. After school, Schwartz runs errands or gets chores done around the house. At the end of the day, if she has time, Schwartz will catch up on her favorite shows on Netflix and BRAVO. “Originally I went to school for costume design. The program I applied to only accepted four applicants so when I wasn’t selected I decided to teach what I love to do which is design! So, I went to college in North Carolina, but decided to move back to KC to begin my teaching career,” Schwartz said. Outside of school, Schwartz likes to relax and hang out with her cats, Scott and Callie. A New Year’s resolution that she has is to read at least 12 books this year. Schwartz also likes to go out and explore new places as often as possible outside of school. “I still think back to high school and have those teachers to thank for getting me where I am today. Also without design, our world we be so boring and I find that that inspires me daily,” Schwartz stated.